L-R: Joe Delafield and Annie Purcell in FASHIONS FOR MEN. Photo by Richard Termine. 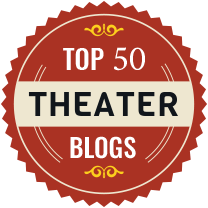 Ever since its founding in 1995, the Mint Theater Company, arguably one of the finest off-Broadway theater companies in the city, has been dedicated to the mission of unearthing and producing lost or neglected but worthwhile plays of the past and infusing them with new vitality. 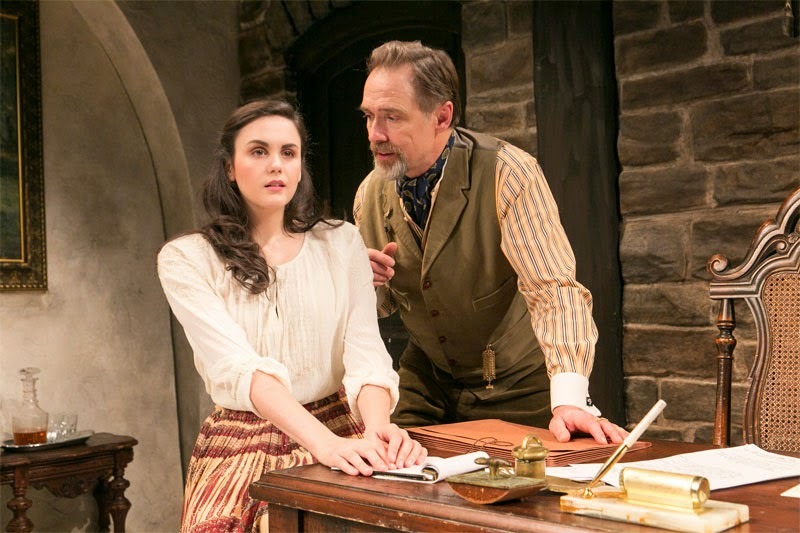 For the past two decades, it has held true to its mission, staging impressive revivals of seldom seen works by playwrights ranging from A.A. Milne to Edith Wharton, from Thomas Wolfe to D.H. Lawrence, from John Galsworthy to Leo Tolstoy, and from Ernest Hemingway to Arnold Bennett. Now, for its first production this year, the Mint, located on West 43rd Street in midtown Manhattan, is staging a freshened revival of Fashions for Men by Ferenc Molnar and it is another winner. Molnar was an internationally acclaimed Hungarian playwright of the early 1900s, whose best known works are Liliom (upon which the classic musical Carousel was based), The Guardsman, and The Play’s the Thing. Less well known is Fashions for Men, a light hearted comedy that was first produced in Budapest in 1917, although it subsequently did make it to New York in 1922 where it had a successful run on Broadway and was adapted into a motion picture (renamed Fine Clothes) in 1925. Fashions for Men plays out in three acts, two set in an upscale haberdashery in Budapest and one in the Count’s study at his manorial estate, Gerelypuszta, and the sets themselves merit comment. They are simply terrific, far superior to what one is accustomed to seeing off-Broadway and at least the equivalent of what one generally finds even on Broadway. Daniel Zimmerman, the play’s Scenic Designer, deserves to be singled out for the major contribution his work makes to the success of this show. Now to the play itself. 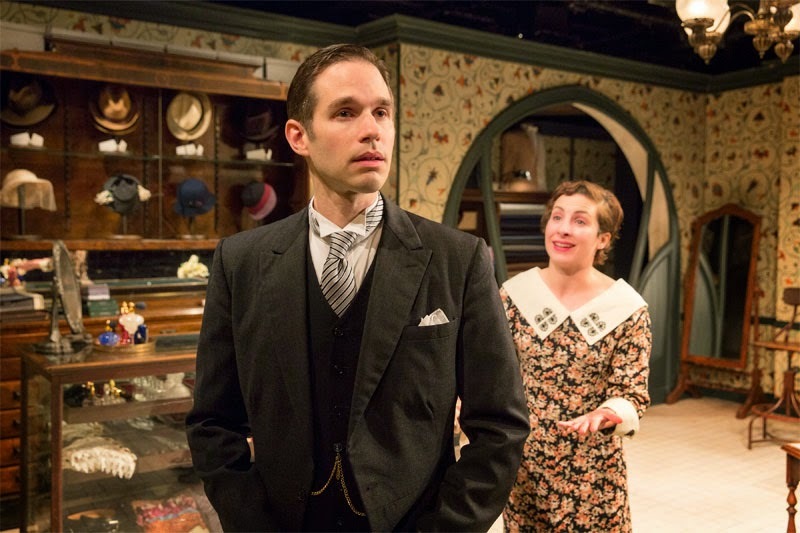 Peter Juhasz, the proprietor of the haberdashery (Joe Delafield), is a very good man, beloved by all, who sees nothing but the best in everyone. But it is his very goodness that turns out to be his undoing as it results in his being taken advantage of by all around him. Although many of his customers fail to pay their bills, he continues to extend them credit to the point that he is approaching bankruptcy. He still might have pulled it out, but when his wife, Adele (Annie Purcell) steals from him and absconds with Oscar, his top salesman (John Tufts), it is just too much, and the shop is thrown into receivership. Nonetheless, Peter blames himself rather than Adele or Oscar for his plight and bears neither of them any ill will. He is, in short, something of a saintly schlemiel – the sort of person who, if you recall the punch line of the old joke, persists in asserting that “There must be a pony in there somewhere!” Instead, he resolves to return to work for the Count, a former employer and benefactor, (Kurt Rhoads) who retains such affection for Peter that he offers him the position of general director of the Count’s Gerelypuszta Cheese Exporting Company. As it turns out, the Count’s affections extend even more to Paula (Rachel Napoleon), the pretty young thing in Peter’s employ at the haberdashery shop, with whom he had been carrying on a flirtation whenever he visited the shop. Peter had seen himself not only as her employer but also as her protector, a relationship that Paula also presumably bought into. So when Peter reveals that he will be leaving the haberdashery shop, Paula contends that she will have to leave too, even if the shop’s new owners would be willing to keep her on, because her mother would never allow her to work for anyone other than Peter and she wouldn’t dream of opposing her mother’s wishes. L-R: Rachel Napoleon and Kurt Rhoads in FASHIONS FOR MEN. Photo by Richard Termine. And so Paula elects to work for Peter at the Count’s cheese company, which is all well and good with the Count, who has had his eye on Paula all along. And, of course, Paula has her own ulterior motive in following Peter. As she explains to Philip, another of Peter’s employees at the haberdashery shop (Jeremy Lawrence), she intends to follow Philip to Gerelypuszta so as not to let His Excellency, the Count, slip through her fingers (although she will pretend to Philip that it is only because she doesn’t want to abandon him in his hour of need). Before the play is over, the relationships among Peter, Paula, the Count, and Oscar have become increasingly complicated but it is all great fun and lest I be forced to issue a plethora of spoiler alerts, I’d best say no more about the plot’s evolution and resolution. Suffice it to say that the entire cast is just wonderful, that the play is cheerful and uplifting, and that I left the theater with a broader smile on my face and a bit more jaunty lift to my step than when I entered it.